Grow Your Own! The Wind Down. – Food. Boom. Grow Your Own! The Wind Down. It’s nice, as we descend into the season of falling leaves and escalating rows about the central heating settings, to be able to say that I have really enjoyed my garden these past few weeks. In the real sense of just being out there and having s good time. In the earlier half of the summer I couldn’t profess to the same, as we became overrun with various beetles, grubs and potato related mishaps atop the standard issues of constant mowing, weeding and felines. 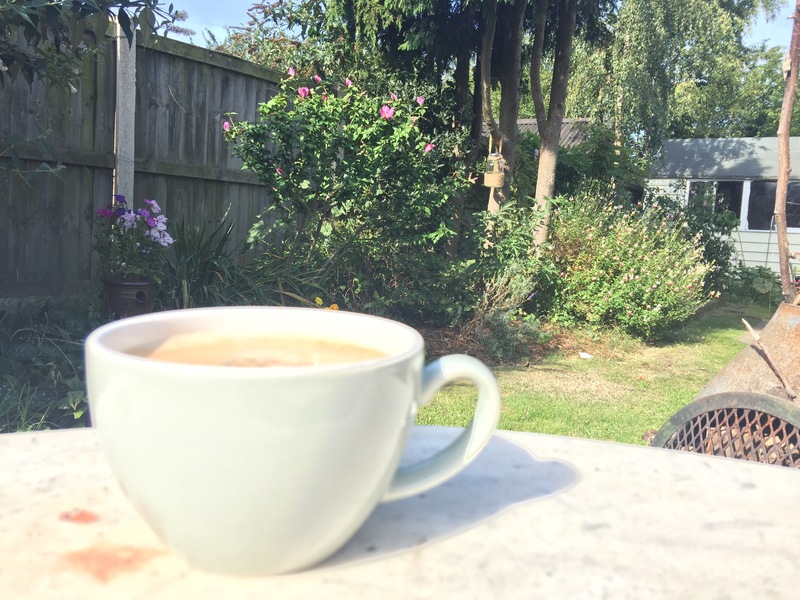 But as it has cooled down a bit and the majority of critters have undergone a mass exodus (something to do with the hellish spiders nest under the conservatory I suspect) it has been positively wonderful to sit out with a coffee of a sunny Saturday and just, well, be. I’m not going to descend into some hippy crap about spiritual oneness with my petunias but there is a definite therapy of the soul to be found by hanging out with nature, even if that is just a bit of lawn and two planters rather than a wild and ranging heathland. Yes, the pumpkins are still running amok and we got no edible radishes to speak of and the carrots weren’t much cop but it is still just lovely to be here. Of course basking in the glow of those few home grown triumphs does increase my smug enjoyment of our outside space. The sight of the dwindling stubs of chard in my patio planters prompts fond memories of the summer-long harvest of tasty green leaves which has only just begun to slow down. My sage plant is thriving in the brick planter, having doubled in size since I swept it out of a sad pile of potted yellow-sticker twigs at the back of Homebase, and makes me feel entirely self righteous and even God like for selecting it for salvation. It is rather wonderful when my eye runs across our two gooseberry plants and I am reminded of the gooseberry gin in the pantry that needs straining, rather than just recalling the pin-picked shreds of my fingers when I was harvesting the damn things. It’s all good. I suspect a purely ornamental gardener might find the Autumn depressing, what with all the tying up and fleecing down and endless bulb rearrangement for the spring. 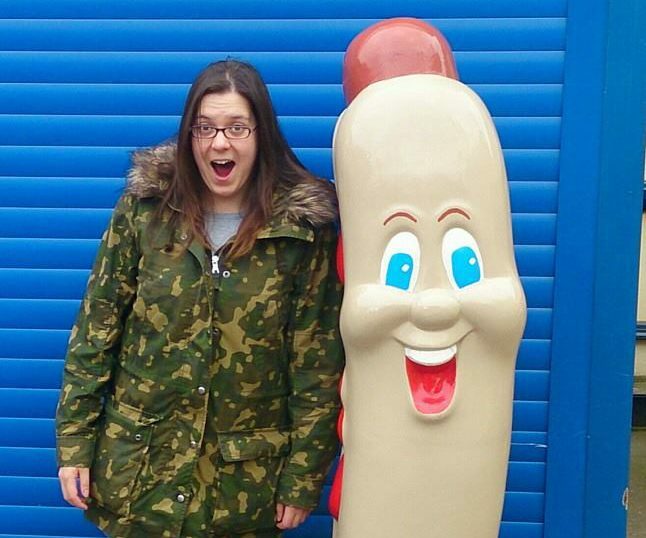 This is the joy of fruit and veg. Spending my previous free hours taming squash vines and trying to entice bigger courgette flowers meant neglecting the big old budlejas which are now enormous but still in bloom and feeding a veritable army of fat bumble bees, which is great, and makes the ‘pretty’ end of the garden a rather shabby delight that is way too far gone to care about now. Yes it’s a mess but it’s full of life and one doesn’t get depressed about drooping flowers and plugging daffodils when there’s fruit to pick and jam to jar. This is no time to rest and contemplate the deadheading for there is so much better stuff to do than tidy up the shrubs. 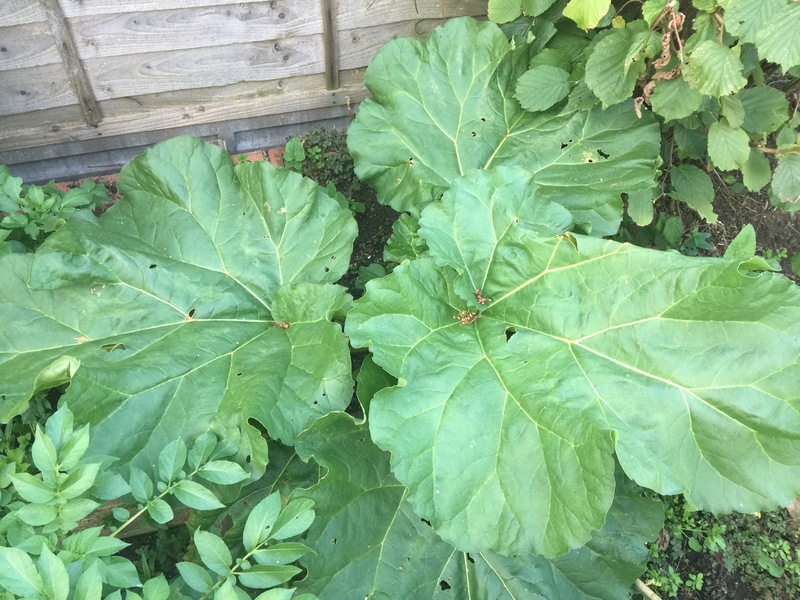 My first year rhubarb plants are MASSIVE, and also undisturbed as common wisdom is against eating these in the first growing season. Having taken some advice I apparently need to bundle up and pin down the huge stems in a way as to both protect the crown over the winter and let the leaves rot some nutrition back into the soil. I sound like I know what the hell this involves I’m sure………. Next, I will start off the winter cabbages on a windowsill now that the caterpillars have evolved off to eat someone else’s green stuff. Then the pumpkins need some care in the final run up to their inevitable October evisceration. So that’s plenty of feeding and preening for them and the late potato crop I planted three weeks ago which should be ready right in time for Christmas dinner. These have sprouted surprisingly quickly, although I’m not convinced at present that there is enough time to get them past the yuky hard green stage. Thankfully the Older Male Sibling will have a line on some last minute festive spuds if it comes to it. And speaking of yuletide, my little pear tree is springing up straight and smart again, unburdened by two and a half kilos of pears which are now pickling in a cool dark space in the pantry. It’s not been a bad back yard haul at all and hopefully by the time it is all done and dusted the flowers will have died off by themselves and left me some nice bare spaces to fill in with crocus bulbs. Research jobs for the spring will be on less harsh bug sprays and more bird-enticing behaviors to adopt, as they have all buggered off since we took out the rotten plum tree and replaced it with a feeding station. Ungrateful, feathered fools. In fact much of the next season will involve reviewing the environmental impact of our lives in both the garden and kitchen. I plan many boring and preachy posts about this, for which you can blame Chris Packham, but that’s for a later time. So I like the autumn, overall. I’ve got pickles and can have a cuppa in the sun without burning and some cyclamen are popping up already to cheer the view while we wait for the January Kings to get going. Ok so it’s getting chilly and of course the bloody cats are still at it, though hopefully I can get hold of some decaying nuclear material and realise my dream to irradiate the spiders under the conservatory into enormous patrol beasts to keep the kitties out for good this time. Watch this space. Previous20 Questions with The Victoria Inn! Next20 Questions With Boneman’s BBQ!